Be the first to share your favorite memory, photo or story of Sandra "Sandi". This memorial page is dedicated for family, friends and future generations to celebrate the life of their loved one. 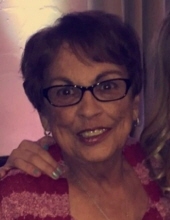 FROST, Sandra “Sandi” Joan peacefully passed away surrounded by her family Wednesday, November 28, 2018 at the age of 74. Funeral Services will be held 11AM Monday, December 3 at Sharp Funeral Home and Cremation Center, 6063 Fenton Road, Flint. Captain Timothy Johnson officiating. Visitation will be held 5PM - 8PM Sunday and 10AM until time of service at the funeral home. Those desiring may make contributions to one's choice. Sandi was born and raised in Flint, MI. She graduated from Southwestern High School and worked the switchboard at AC Spark Plug. She later worked at Bendle Public Schools where she created several bonds with students whom she loved. After, she worked as a secretary at Averill Avenue Church of Christ. Sandi loved to spend quality time with her family, especially during the holidays. She also loved to camp, play card games, and tend to her numerous flower gardens. Sandi loved to travel with her family as well, especially her annual trips with her sisters and mom to Branson. She is survived by her husband of more than 50 years, Philip Frost; beloved sister Joyce Harrison; daughters, Deanna Frost and Kelly Root; son-in-law David Root; grandchildren, Mikenzie Frost, Macie Root, Maxwell Root and Mallory Root, and several nieces and nephews. Sandi was preceded in death by her mother and father, Hilda and Everett Harrison, and her sister and brother-in-law, Jerrie and Chuck Johnson. Her infectious laugh could fill a room and her bright smile could lift anyone’s spirits. Sandi’s love for her family will continue to be felt, but hearing her comforting voice will be dearly missed by all. While her’ family’s lives will never the same without her in it, their worlds are better because she was. Tributes may be posted at www.sharpfuneralhomes.com. To send flowers or a remembrance gift to the family of Sandra "Sandi" Joan Frost, please visit our Tribute Store. "Email Address" would like to share the life celebration of Sandra "Sandi" Joan Frost. Click on the "link" to go to share a favorite memory or leave a condolence message for the family.